There’s no such thing as a Scandinavian flag. This is a Norwegian flag. Norway, together with Sweden and Denmark is part Scandinavia. Scandinavia is not a country. I have trouble seeing as Scandinavia is three separate countries with three separate flags (and other colors), but excusing that and assuming you were inspired by the norwegian flag, the design is very good. Just get your facts right. I would like to apologize for the mistake in the description. Yes it should read Norwegian flag. I very much appreciate the individuality of each country. 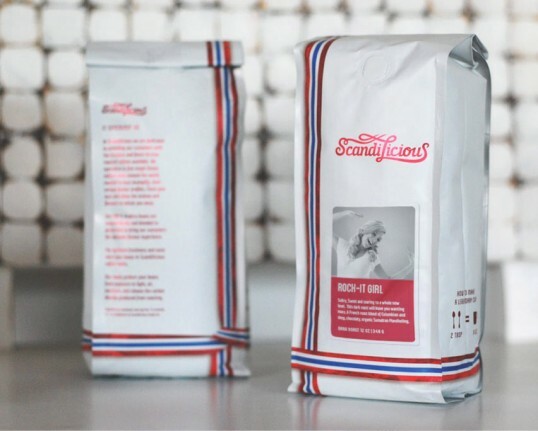 Cute idea, because us Norwegians, drink a lot of coffee and are considered to be big coffee snobs. 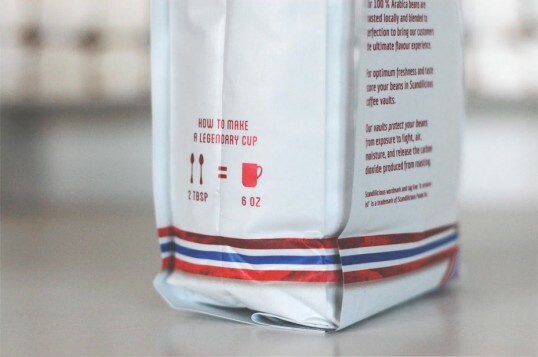 I think the packeging itself, communicates coffee, but the design itself, does not. Maybe I could stretch myself as far as this could be a bag of tea…or healthy norwegian cookies? And as far as the swooshy Script type – Scandinavian design approach are known for being much more clean and crisp.